1. How to fly Emirates for $20 in Business Class. This used to be the worlds lowest international 1st class flight that now only has Business Class as the premium cabin due to a recent equipment change. – flying 1st Class Etihad Apartments to New York for Zar 1036. – flying 1st Class Etihad Apartments to London for Zar 266. – flying 1st Class Etihad Apartments to Mumbai for Zar 1800. – flying heaps of SAA Business class to Hong Kong and Abu Dhabi for Zar 450. + heaps of Seychelles, India, UAE and Mauritius in Business Class return under the Zar 8k mark but lets get back to the topic on hand. We have made our second ever YouTube video for this, I do have all archived video footage of every trip TL has been on since its inception in both flights and hotels so the articles above will be made available in vlog mode soon. Access our Youtube page HERE. Subscribe to get notified on our videos and vlogs. 2. IHG buy points. targeted 100% bonus. Sadly the worst round of Pointbreaks just came out that I have seen in a decade in our previous newsletter however its only valid 2 months, lets hope they pull up their socks on the next round taking us into year end hopefully with some premium properties for 5000 – 15000 reward points. Prob the first time ever that nothing interested me to book. If you have the need for points and they saving you cash ( take note of breakfast costs per person) take up the below. 3. Marriott and SPG merges on August 18th! 1. We on YOUTUBE ! Finally. In Travel we took the words: Outrageous, Adventure, Plush, Ocean, Upgrades and made our very first Youtube clip. 2. Bangkok’s best. The St. Regis Suite upgrade worth 50k pn. In our Thailand adventure, St. Regis Bangkok went one up on the upgrade vs our previous St. Regis Kuala Lumpur one, upgrading the room to a massive John Jacob Astor Suite worth 50,000 Thb per night ( paid 5100 Thb). 3. Singapore Airlines massive sale. Never seen fares this low on SQ. They have just made it public on their webpage, we had the amazing fare to Maldives for R5500 up over 4 days ago on our Instagram account. ( Never miss out ). Check the individual t&c of each fare, some come with a 20$ voucher for Changi (Sin) others may need dual pax or stay conditions. Check my links on scoring accom in Asia #theTLway over HERE. A ton of destinations from R5,000. Access SQ sale page HERE. 4. SPG buy Starpoints at -35%. SPG’s last hurrah before they get dissolved into Marriott Rewards. If you have been following my posts there is a huge opportunity to score best of the best accommodation August – December when their award charts combined should yield a massive luck with 5th night free for elites. Access our SPG page HERE. Kindly copy and paste the link below for direct newsletter subscription with anyone and everyone you may know who lives, loves & breathes travel. Sign up everyone you know to our free newsletter, tell them about our world exclusive offer, follow us on Instagram, Youtube, Facebook and Twitter, all under the handle: Traveloyalty & NEVER miss a great deal. Follow the links in yellow to make sure you never late on getting a breaking deal notification from TraveLoyalty on Facebook and Instagram above. Subscribe our Youtube channel for our videos and vlogs. 1. HAWAII – finally after 25years! Tip: see the offers / deals at Ritz Carlton KL. Book between 4th to 10th June, 2018 for stays between from 7th June to 31st July, 2018. Access the offers HERE and HERE. 4. HUGE ME3 shake up. 4.2 Etihad announces ‘enhancements’ .. Some pretty heavy changes to last minute bookings in economy. First and Business doesn’t seem to warrant any effects however they have not released a updated award chart as yet. partner airlines are unaffected so we still have the steal of Business class to Seychelles and beyond as per many of my Instagram posts on scoring. One leg I’m keeping my eye out for is Johannesburg to Phuket that goes for only 22k miles and R2200 tax. 4.3 Qatar – I truly have no words left. Surcharges and Devaluation of 60%. 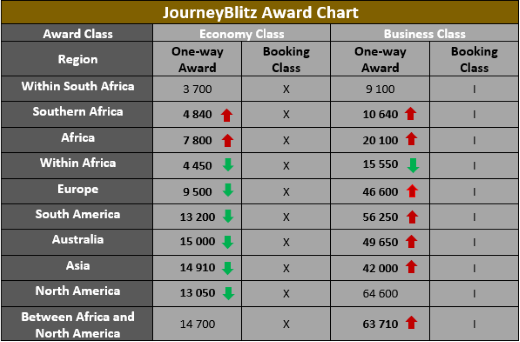 Qatar has added surcharges to award tickets by $25 in Economy, $50 in Business and $75 in First Class PER SECTOR and then in an eye blink put up the awards by 60% !!! The Qmile program was already hard and lacking of value prior, this makes it even harder, feel so sorry for those who have accumulated Qmiles looking to score a journey in future. I don’t have a landing page as they have done this without any notification. 1. Hotel Hop Hong Kong free. MEGA post. Flying in Business class for R900, eating Sushi, best of suites at Grand Hyatt, eating Sushi, best of suites at Renaissance and JW Marriott and eating more sushi. Premium complimentary lounges throughout and scoring a ton of points + certificates to travel free ahead. 2. Hilton Summer Sale EMEA. Book June 5th – Sept 3rd. Sale is page is not active as yet as few hotels are still finalizing the 20-30% discount. Click the link below in the coming days to check the pre-sale and start. Access our Hilton page HERE. 3. Hilton APAC sale. 30% off. Ends June 8. 4. Wander More. 30% off. May 1st – Sep 30th, 2018. Mega Bonus 750 points per night, from 3rd night. Access our Marriott page with all offers HERE. 5. Accor Super Sale. up to 40% off. You can also buy points on sale offers during the year and earn up to 100% bonus on purchases. Currently there is a 80% bonus offering HERE. 1 The Royalty worthy St. Regis, Kuala Lumpur. 2 Hilton buy points 100% bonus. Ends June 7. 3 SPG buy points at -35% off. Ends May 31. The worlds most valuable point at what might be their last sale ever as they fold into Marriott Rewards on August 1st. Excellent for points to miles transfers to upgrade to business and First with 25% bonuses. See a video snippet HERE. 4 IHG buy points. 80% Bonus. Yearly limits increased to 100k. 5 Hilton Double points. May 1 – Aug 31. 6 IHG Time is everything. May1 – July31. Trip to Bali. Conrad Presidential Suite upgrade. During October 2017 a Far East trip was once again on the cards, Scoring massive upgrades in all different hotels visited in 2 countries. Up first we have Conrad in Bali. I’d rate this upgrade in my top 3 on sheer size. 364sq meters of living space ! First Class trip to Disney World. First Class trip to Disney World, Orlando. Scoring upgrades and scoring more. Repeat. What started out as a random conversation in traffic one afternoon during mid June regarding my late 1980’s adventures to Disney World in my youth and how awesome it was as I still rate it as one of best days of my life, got the kids worked up again , ‘please lets not go to back Maldives, lets do Disney’ was their response after experiencing a bit of theme parks in Malaysia and Singapore during April’s trips abroad. 1 Etihad Guest transfer promo with 20% bonus. March offer. Look into Accor, SPG, IHG & Hyatt conversions for that super easy FIRST and Business class upgrades you often see on my Instagram account. Sadly I don’t see Heathrow Rewards as an option. SPG gives a 5k bonus in any event + they have a sale on points until March 16th below. options.. options..
2 Hilton buy points. 80% bonus for most. 3 Marriott and SPG award changes. OMG! Take a good look at whats moving up and down. If its going down wait to book after March 6. If its going up book now asap, remember Marriott allows you to book and earn points before check in uniquely. Also take note of SPG points sale below. 4 Saa Voyager Journeyblitz. Ends March12. Posted this few days back on my Instagram way before SAA had it up when avail was oh-so-plentiful. Take note there are quite a few changes. Mostly positive for economy and Negative for Business class routes. My favourite booking to Hong Kong in Business now costs 42k miles and taxes have gone up too, booking return swop the country of booking and taxes are lower on the Inbound. Economy New York is now 13k miles… who on earth redeems Voyager miles for domestic travel. If you new on this and not sure what to do, use the window search ‘journeyblitz’ on www.traveloyalty.com for all previous advice and tips to avoid errors. Log into Voyager to book. Access the new award chart info HERE. 5 Daily Getaways are up soon. Preview April 2. If you new to travelling #thesmarterway you will love this promo where many are able to buy extra deals on top of their yearly thresholds. Apparently Amex is now back on board as a sponsor so lets hope we score the extra -10% off that eluded us last year. Simply the most awesome sale of buying hotel points, buying loyalty status and theme park tickets that comes along only once a year. I invested in heaps of specials is the last few years. Don’t miss out. Please note: points takes 10 days to ship to your Loyalty account and use any American address when filling out the billing. 6 Hilton Conrad 4th night free offer. 7 IHG promo 71k points offer off 3 stays. Ends 31 Dec.
IHG is a real hit this quarter as this blends in with Accelerate promo. Bonus if you find yourself in The USA Kimpton ( Kimpton Karma) is now part of IHG Rewards Club and offering 10k bonus on top of Accelerate promo. Will update the link and offer on Facebook soon as live. Don’t miss it. Great way to get points to transfer to miles for airline upgrades 20k Starpoints = 25k airline miles in most airlines except Air New Zealand. Also great for Cat 1 and 2 properties. See my next trip review up soon. Starpoints transfer’s great into Marriott Rewards at 1 point = 3 points respectively. So So many options here..
9 Starwood SPG member exclusive, bonus points promo.